Google+ Local can be found through the new ‘Local’ tab that is located on the left-hand sidebar of Google+ (see snapshot below). Google+ and Local pages feature a 30 point Zagat score and recommendations from people in ones’ “Google+ circle”. Users can publish reviews, photos, and other useful information about their favorite places. Users can get place recommendations based on their past reviews and location. 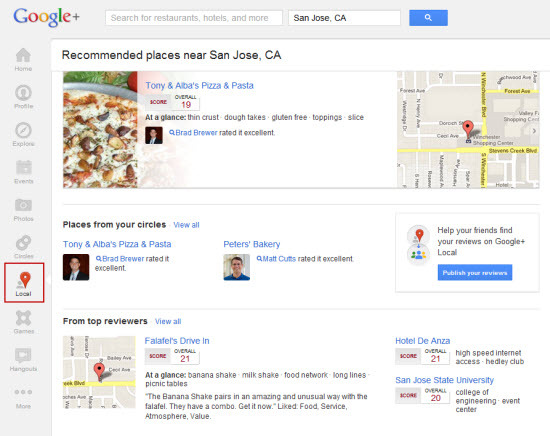 Google+ Local page results are integrated with organic results and will show under Google Search and Google Maps too. If you are a local business that previously had a Google Places page then all your information has been migrated to the Google+ Local pages. Do keep an eye on the reviews, photos, and information about your business on the Google+ Local pages to ensure these are accurate and also for proactive reputation management.